The pear-shaped, dark-skinned, but bland avocado (Persea americana) is not only the main ingredient in the popular guacamole dip, but also a great ally in the fight against cardiovascular disease. Avocados are 12% unsaturated fatty acids, a healthy kind of fat with great anti-inflammatory and antioxidant effects and benefits on the vascular system. Their outstanding cholesterol-lowering properties make them a great addition to any diet and an excellent substitute for animal based fats such as butter and even some vegetable oils. Avocados are a great source of B vitamins, copper and potassium and contain powerful phytochemicals with strong antioxidant activity. Eating them on a regular basis not only contributes to good immunity and beautiful skin, but also improves the absorption of numerous fat-soluble nutrients such as carotenoids, vitamin E and vitamin K. Moreover, regular consumption preserves blood vessel health, helps regulate blood pressure, supports digestion and may exhibit anti-aging effects. What does avocado look like? There are some differences between the various types of avocado. Generally, avocados are more or less pear-shaped and range in size from egg-size to a small grapefruit. They have a bright green, glossy skin that grows darker as the fruit ripens, a light yellow-green pulp and one big, brown seed in the middle. Some varieties are rounder, while others are more elongated. Also, avocado skin can be either glossy or rough and, in some varieties, it is considerably darker, even when the fruit is unripe. What does avocado taste like? Avocado is not sweet like other fruits, nor is it sour, bitter or greasy in a bad way. It has a creamy or buttery texture and a rich taste, but no flavor. At most, it has grassy flavors and a bland, but not fatty taste. How to pick a good avocado. When choosing avocado, you first have to take into account how ripe you want the fruit to be. If you are not planning on eating it that day, you might want to choose a fruit that is still unripe: it should be bright green in color and feel firm. Leave it at room temperature with some apples and banana to ripen. If you want it to ripen slower, put it in the fridge. An unripe avocado should last like that in the fridge from 4-5 days to a week. After this time frame it should be ready to eat, but it’s best to check it every day to see how ripe it gets. Some ripe avocados have a dark green skin, except for a variety know as Hass, which should have a dark purple, almost black skin when ripe. Other may preserve their initial color when ripe. But more important, ripe avocado should feel soft and give into pressure when squeezed a little. If ripe, you should be able to simply open it with your hands and scoop out the inside pulp with a spoon. A ripe avocado has a soft, creamy flesh and very little green or grassy flavors. 1) Great for the heart. Avocados are rich in mono and polyunsaturated fatty acids (about 12%), healthy fat which offers antioxidant protection to blood vessels and regulates blood cholesterol levels. Several studies have shown that eating avocado on a daily basis for more than 2 weeks can reduce LDL (bad) cholesterol and triglyceride levels by up to 10-17%. The healthy fats in avocado also improve the absorption of carotenoids and other fat-soluble nutrients such as vitamin E by 200%. The high fiber and phytosterol (beta-sitosterol, stigmasterol, campesterol) content of avocado is also an important factor for lowering blood fat levels and for the prevention of cardiovascular disease. 2) Maintains colon health. How? With 6.7 g of dietary fiber/100 g of raw pulp, avocado adds bulk to stools and thus facilitates regular bowel movements. This, in turn, reduce the time the colon is exposed to waste and strain associated with difficult bowel movements which is said to contribute immensely to colon health. In addition to this, the healthy fats in avocado ease stool passing through the intestines and thus help relieve constipation and prevent and manage hemorrhoids. 3) Reduces diabetes and metabolic syndrome risks. As mentioned above, avocado contains healthy fat in the form of monounsaturated Omega-9 (oleic acid) and polyunsaturated Omega-6 (linoleic acid) fatty acids. Healthy fat from plant sources puts far less strain on the body and is less likely to be deposited in the form of visceral (belly) fat, one telling symptom of metabolic syndrome. Basically, a diet rich in fatty animal products raises bad cholesterol and triglyceride levels, causes high blood pressure, insulin resistance and predisposes to diabetes and obesity, an assembly of symptoms known as metabolic syndrome. Studies reveal that replacing fatty animal products with healthier foods such as avocado and having a reasonable fat intake can drastically reduce such health risks. 4) Excellent antioxidant content. Avocado is shown to contain powerful antioxidants such as alpha-carotene, beta-carotene, cryptoxanthin, lutein, zeaxanthin, neoxanthin and violaxanthin. Their role is to protect our cells and DNA from harmful reactive oxygen molecules (free radicals) and help damaged cells repair themselves in order to prevent them from mutating into cancer cells. Most of these antioxidant carotenoids also have provitamin A activity, meaning they are partially synthesized into vitamin A by our body and used for maintaining good eyesight and healthy mucous membranes. Other potent antioxidants found in rather generous amounts in avocado are vitamin K (17.5%), vitamin C (17%), vitamin E (14%) and copper (21%). Not only do they efficiently reduce inflammation markers, but they also boost immunity, prevent wrinkles, ensure skin beauty and delay hair graying. 5) Great source of B vitamins. Another reason why avocado reduces heart disease risks is its high B vitamin content. As you can see in the nutrition table above, avocado provides generous amounts of folate, niacin, pantothenic acid, pyridoxine and riboflavin, B vitamins which convert the harmful amino acid homocysteine into cystein and thus aid in the prevention of coronary heart disease. Also, folate (vitamin B9) is an essential vitamin for pregnancy because not only does it boost fertility, ensuring a woman succesfully carries the pregnancy to term, but also prevents severe spine defects in newborns called neural tube defects. Despite its high fat content and the fact that it contains 160 kcal/100 g, avocado is actually heart and figure-friendly. The amazing mix of nutrients such as vitamins C, E, K, B vitamins, copper, potassium, magnesium, iron, zinc, unsaturated fatty acids and carotenoids contributes immensely to the prevention of cardiovascular disease. Even more, avocados keep inflammation levels and oxidative stress, two known cancer-causing factors, within normal limits. Conclusion. 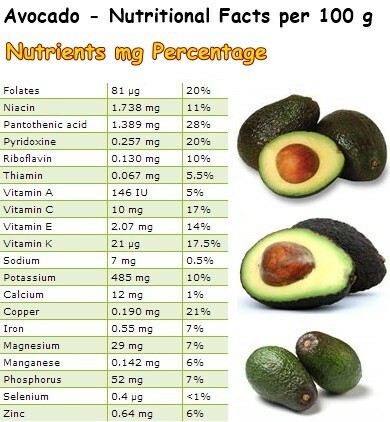 Overall, avocado is an above-average nutritious fruit and consumption is highly recommended. The only side effects would be eating too much and gaining weight as a result of this, or being allergic to it. Avocado allergy can be triggered by either ingesting the fruit or coming into contact with the sap of the tree. Also remember that avocado (fruit, bark, leaves, seeds) can be fatal to pets and farm animals.